An acousto-optic tunable filter (AOTF) is a solid-state, electronically-addressable random-access optical pass-band filter. It may be used to rapidly and dynamically select a specific wavelength from a broadband or multi-line source. When specific matching conditions between the acoustic and optical beams are met, diffraction will occur. As a result it is possible to electronically control key filter parameters such as wavelength, modulation-depth and even bandwidth, thus providing rapid (typically μs), dynamic, random access optical filtering. Resolution bandwidths down to <0.1% are available with exceptional performance and with aperture sizes up to 25 mm and beyond. We have developed and patented techniques to allow us to offer options such as large-aperture imaging filtering, sideband suppression, and transmission of multiple discrete wavelengths. We offer a range of AOTFs to suit a variety of applications. For scanning an entire image in wavelength at speeds sufficient for real-time video rate spectral imaging, high optical throughput is required. For this purpose devices with large aperture and/or field of view are recommended. The STBR series Dynamic Tunable Bandpass Filter adjusts the center wavelength of a narrow band of light over a 100 - 200nm range. 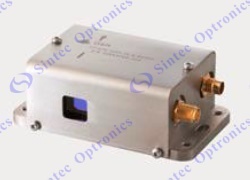 It offers very high resolution of ~1.5nm and either single or simultaneous multiple wavelength selection. It is able to precisely and rapidly adjust the wavelength and intensity of the diffracted/filtered light by varying the frequency (see graph) and RF power. We offer both free-space and fiber-coupled configurations. 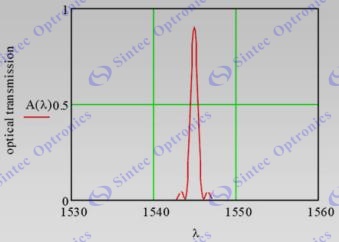 AOTFs are used widely in numerous optical systems and applications, especially in industrial or process control near-infrared (NIR) spectroscopy applications. Other optical apertures are available upon request. UH – Ultra high Resolutiontandard resolution. 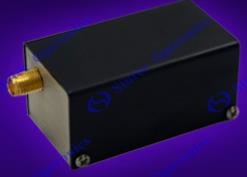 The STBR dynamic tunable bandpass filters are commonly used to dynamically select among different wavelength channels at the receiver end of dense WDM transmission systems. Other applications include tuning the center wavelength of broadband sources (such as white light sources or LEDs) in laboratory test and measurement systems. A typical band-pass shape of the selected light by AOTF filter is shown in the diagram above on the right. Other fiber types are available on request. FC, SC, LC, SMA, etc. Enclosure The unit will be packaged in a 190 mm (7.5 inch) wide by 90 mm (3.5 inch) high by 220 mm (8.75 inch) deep instrument case. The rear panel heat sink increases the depth to 270 mm (10.5 inches) maximum. The size is exclusive of connectors. A detachable AC line cord and RF cable are provided. Environmental Nominal Laboratory conditions: The maximum ambient temperature is +35° C. The unit is not sealed against moisture or condensing humidity.